Social Media is the king of all platforms when it comes to content going viral at rocket speed. You can post an image or message and it will reach the other side of the world and be seen by potentially millions within a day or so. That’s the power of social media in a nutshell. But the type of content that goes viral more often than not are videos and social posters. People love videos and they love images with thought proving quotes or phrases. They can be referred to as motivational images or social posters. This type of content gets shared across websites and blogs also. What makes them so effective for the creators is the opportunity to brand these images with their own personal details which gets shared and liked by millions of people and ultimately can bring in a lot of traffic. The great thing about it is that it’s all free. You don’t pay a penny to get your content shared. If people love the content, it will get shared. The challenge though is finding eye opening and catchy social posters that have the potential to make people want to share it across their network of friends and colleagues. 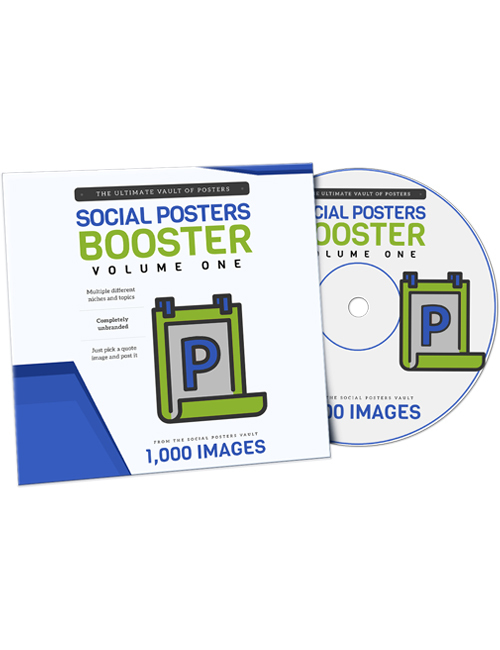 This massive pack contains over a thousand amazing social posters which are available to you at the click of a button. These posters cover numerous topics and appeal to people of all types. You have to see it to believe it so when you’re ready, grab this awesome pack.